From left are Cadet Kolton Martinez, Cadet Aerial Smith, Cadet Aaliyah Edmonson and Cadet Cory Vines. Two cadets from Natchitoches Central High School JROTC Program teamed up with two JROTC cadets from North DeSoto High School to form a joint color guard to present the Colors at the SSG Richard L. Vazquez Memorial Highway Dedication Ceremony Aug. 6 at the DeSoto Parish Courthouse Lawn in Mansfield. 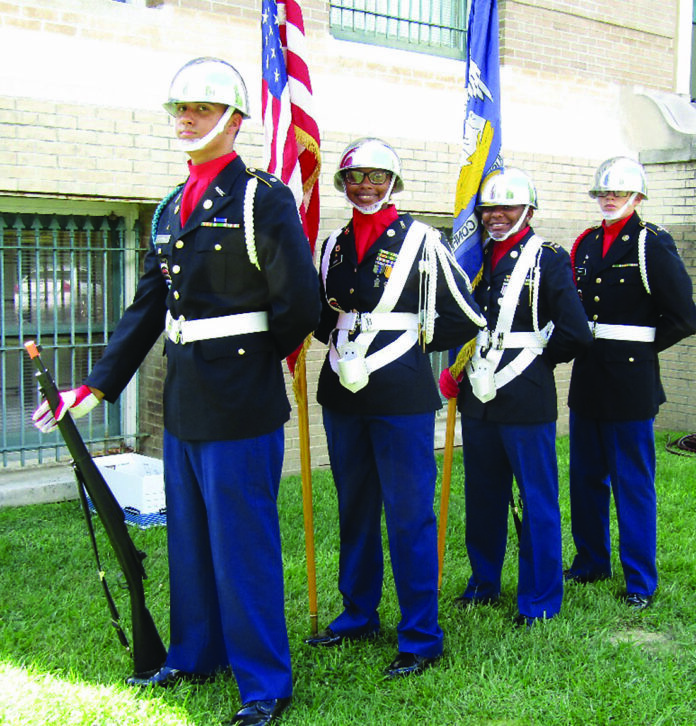 Natchitoches Central JROTC cadets formed a joint color guard to present the Colors at the SSG Richard L. Vazquez Memorial Highway Dedication Ceremony Aug. 6 at the DeSoto Parish Courthouse. SSG Richard L. Vazquez was assigned to the 3rd Battalion, 7th Special Forces Group (Airborne) at Eglin Air Force Base, Fla., and died in Kandahar of wounds Nov. 13, 2013, when his unit was attacked with an IED while on dismounted patrol in Panjwai. He was on this third tour in Afghanistan.